Hello, I’m a tea master of this tea house, Koto, a 1 minute walk from Kinkakuji temple (golden pavilion). 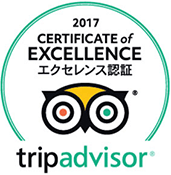 Leaning the tradition & ritual manner in a tea room, you can feel the spirit of Zen and “how to enjoy Japanese culture” in 45 minutes. I’ve just renewed our shop curtain in front of the door. 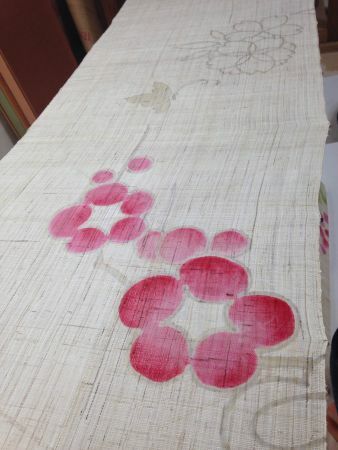 It’s handmade by the professional kimono artist, who is my senior of the tea ceremony class. The original shop curtain made from Japanese kimono techniques. 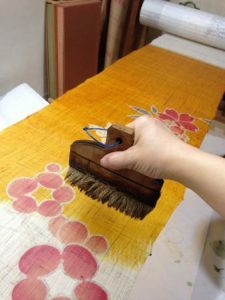 “Ro-ketsu” is one of the special techniques to make Japanese kimono. Surprisingly, it had been used since 7-8 century in Japan. 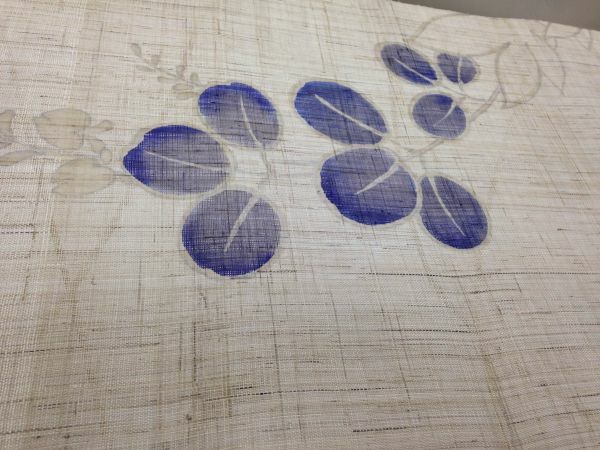 We still can see the old cloth of Ro-ketsu technique in the museum Sho-so-in in Nara prefecture. 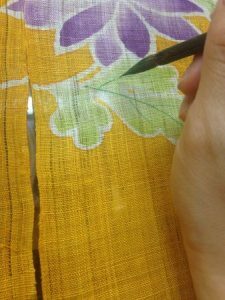 Covering the lines by wax, the cloth will be dyed colorfully. First, the design is copied into the cloth. 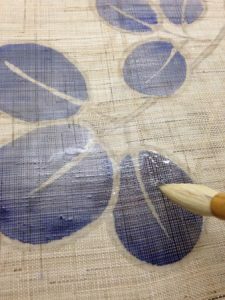 The lines of designs were covered by the wax, then it won’t be dyed. You might have heard of the Yu-zen dying (Yu-zen zome) for kimono. It is covered by the starch, not wax. 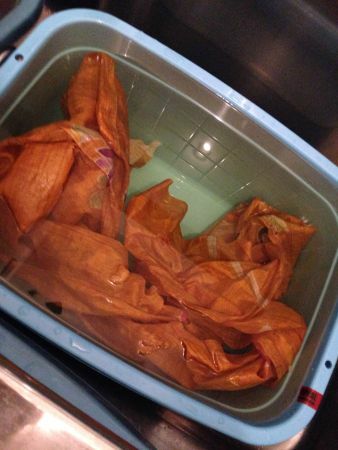 After covering the lines, dye with the color. And bush clovers for early autumn. The traditional Japanese art in Kyoto! After pasting the color, she cover them again by wax. It needs to be covered many times to use varieties of colors. Completing the small designs, the base yellow color is pasted by the large brush. After dying everything, wash few times for not oozing out in the rainy day. In the end, she described the details on the design. Now, it’s the veins of the leaf. 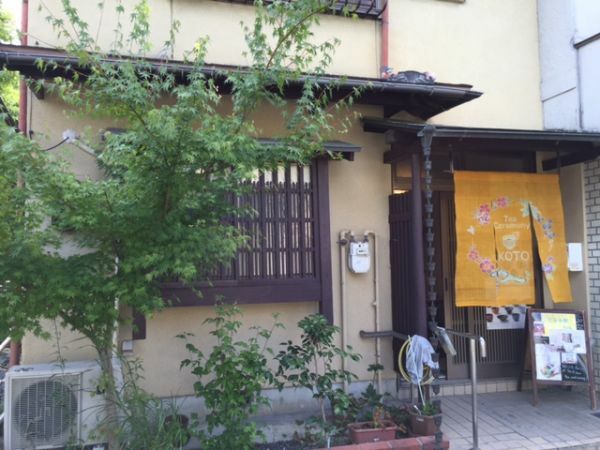 It was so lucky that an excellent artist who usually makes gorgeous kimono (Furisode) and so on made my shop curtain! The flower circle is pretty! 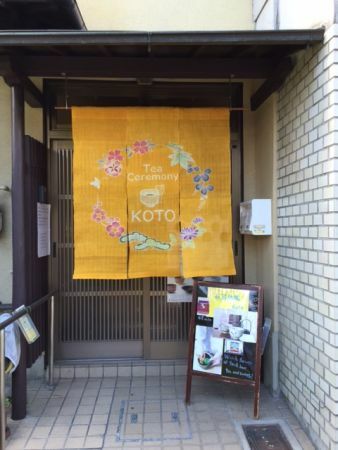 It represents we would like to express the changing Japanese seasons in a tea room authentically. I guess it’s easy to find from Kuramaguchi Street, on the way to Kinkakuji temple (Golden pavilion). You can take the photo free. It’s the traditional Japanese art!